Ragnar Arnason, Professor of Fisheries Economics at the University of Iceland, criticized the call for a special tax or resource charge in fisheries at an international conference on the quota system and resource rent taxes, in the memorial hall of the University of Iceland Monday 14 October 2013. According to him, the call for a special tax on fisheries was based on two false assumptions about the fisheries. The first was that the profit generated in this sector derived from the resource alone. If this was the case, why was there then no profit prior to the quota system? The truth was that this sector was only profitable under the right set of rules. The other false assumption was that a special tax on fisheries would not distort the creation of wealth in the sector. Quite the contrary: Such a tax would remove the incentive of quota-holders to maximise the long-term profitability of the resource, for example by limiting the total allowable catch to the economically most efficient level. It would stifle innovation, transfer capital to other sectors and discourage spontaneous co-ordination within the fishing community. Moreover, it would reduce the competitiveness of the Icelandic fisheries in international markets: While the Icelandic fisheries were profitable and did not receive any government subsidies, fisheries in the neighbouring countries were all heavily subsidised. Ralph Townsend, Professor of Fisheries Economics at the University of Maine and a former President of the North American Association of Fisheries Economists, argued that fisheries would create most wealth for their respective countries if quotas firmly belonged to their holders. He described his experience as Chief Economist for the New Zealand Ministry of Fisheries, and pointed out that New Zealand and Iceland were the first countries to adopt a comprehensive system of ITQs, or Individual Transferable Quotas, in fisheries. The result was the same in the two countries: Losses turned into profits. Townsend said, however, that the system could be made more efficient if the TAC, or Total Allowable Catch, over each season was set, not by government bureaucrats, but by those with most at stake—the quota holders themselves. Fisheries economists had, after a promising start in the 1950s, neglected to develop ideas about efficient self-governance in the fisheries. Possibly the idea of a corporation owning and managing each kind of fisheries would be appropriate. Dr. Gunnar Haraldsson, Director of the Economic Research Institute at the University of Iceland and the former Fisheries Senior Adviser at the OECD, analysed the CFP, Common Fisheries Policy, of the EU, European Union. There was a consensus, Haraldsson said, that the aims of the CFP, such as the long-term sustainability and profitability of fish stocks in EU waters, had not been achieved. 95% of the Mediterranean fish stocks and 47% of the Atlantic fish stocks were being overfished, according to recent statistics, while subsidies to European fisheries amounted to 3.3 billion euros, or to roughly half of the value of the total catch of European vessels. It was well-recognised by EU leaders that the CFP had to be revised. Some of the possible reforms now being discussed were to transfer the management of some fisheries to individual regions and associations and to create some kinds of fishing rights which need not however be labelled ITQs. One problem was that TACs, Total Allowable Catches, in European fish stocks were all set in Brussels, not always according to the best scientific or economic advice. From left: Kristjan Loftsson, Ralph Townsend, Hannes H. Gissurarson, Dadi M. Kristofersson, Gunnar Haraldsson. Photo: Omar Oskarsson. 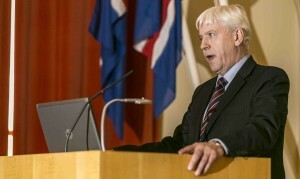 Hannes H. Gissurarson, Professor of Politics at the University of Iceland, wanted to focus on the political and ethical aspects of the utilisation of scarce natural resources. If the freedom of one to utilise a resource was not to harm others or to infringe upon their rights, access to the resource had to be limited. An old Icelandic example was “itala”, summer grazing rights in the mountains being allocated as quotas to each farm in the valley community below. Another example was the system of fishing rods in the Icelandic salmon rivers, by which each farm owned a right to the use of a preset number of rods in the river per day during the season. The third example, of course, was the quota system in the Icelandic ocean fisheries. In the beginning, quotas had been allocated according to catch history, because that was the only way to limit access without changing too abruptly the conditions under which the owners of fishing capital operated. The only right which had been removed from others had been the right to run fishing firms at zero profit; and this right was by definition worthless. Gissurarson then moved on to whaling. He asked why whale preservationists could send whales to “graze” in the fertile Icelandic “meadows” or fishing grounds, where the whales were taking about 6 million tonnes of krill, other seafod and fish each year, while the Icelandic fishing fleet harvested little more than one million tonne of fish each year. This was as if somebody sent his pets to graze in the garden of his neighbour without the neighbour being allowed to do anything about it, neither to utilise the pets or to receive any compensation for their grazing. Similar considerations applied to the mackarell, Gissurarson said. This highly predatory, but tasty fish had recently moved into the Icelandic waters, almost like the biblical plague of locusts. The EU threatened sanctions, however, if the Icelanders harvested more than a fraction of the mackarell. It was as if a farmer would allow his cows to drift into his neighbour’s meadows, and then resolutely refused to compensate the neighbour in any way. Ingibjorg Bjornsdóttir by the bust. Photo. Omar Oskarsson. 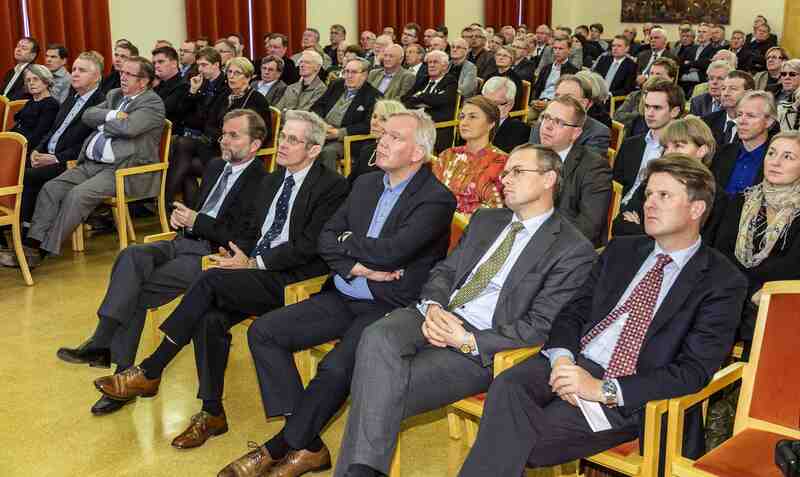 The conference was held in the memory of Arni Vilhjalmsson, Professor of Finance at the University of Iceland and a leading Icelandic entrepreneur and businessman. 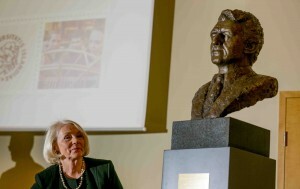 One of the companies which Professor Vilhjalmsson was involved with, Hvalur Inc., gave the University a bust of Vilhjalmsson, sculpted by Gerdur Gunnarsdottir. The bust was handed over by Kristjan Loftsson of Hvalur, and Vilhjalmsson’s widow, Ingibjorg Bjornsdottir, unveiled it. Dr. Dadi Mar Ingolfsson, President of the School of Social Sciences at the University of Iceland, received the bust on behalf of the University, and he also chaired the conference which was very well-attended. Vilhjalmsson was a respected and popular teacher, and many of his old students were present. After the conference, there was a reception on the premises. 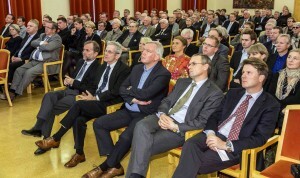 The main sponsors of the conference were Hvalur Inc. and Landsbankinn, where Vilhjalmsson served on the board for many years. He was also on the board of many prominent Icelandic companies, such as Icelandair, Nyherji, Hampidjan and Grandi. The conference formed a part of the joint RNH-AECR project on “Europe, Iceland, and the Future of Capitalism”. The conference was well reported in the press, Morgunbladid publishing an account of it 15 October and an analysis of the papers 17 October. Gunnar Haraldsson Slides 14 Oct.
H.H. Gissurarson Slides 14 Oct.